Bored with vintage-style synth hardware? How about an instrument that does the sort of audio mangling – as standalone hardware, not an iPad app? That’s the promise of the GR-1 Granular Synthesizer, teased by Tasty Chips Electronics via Facebook and launching soon as a Kickstarter project. 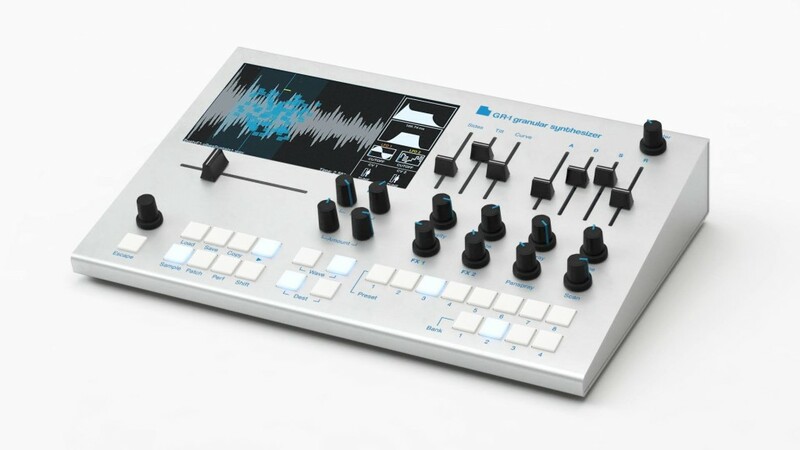 The GR-1 can be controlled via MIDI (USB/DIN) or be used standalone. Update firmware, load samples or save (and load) patches/performances to your USB disk or internal memory. CV and gate options to connect easily with your (eurorack) modular setup. 4 banks of 8 overwritable preset buttons, within a performance. This means you can save 32 presets, each with different samples, in a single performance. You can save as many performances as your USB disk can store. Quick push-button access to presets is especially nice, as is MIDI and CV support. Early bird pricing may be lower, too – let’s watch. Also, this is a granular playback device more than a sampler. It is not in the planning. Samples can be load/imported from USB disk, there is no realtime recording on the GR-1, it does realtime sound generation and processing. I’ll still wait and see – this could be lovely. And the response suggests just how badly people want granular features. I think this is win/win – you might happily end up with this hardware or (uh, well for me) you might be motivated to finish that DIY project you were dreaming of, the one that does exactly what you want.